Ever wondered wondered what the difference between a ball point pen, and a rollerball pen ? Wan't to know which type of pen is best suited to you writing needs ? This guide will help answer your questions by explaining how each type of pen works, the kind of ink they contain, and describes pen tip widths for different kinds of pens. Ball point pens are the most common writing implement in use today, providing a reliable, cost effective writing experience at a price that almost everyone can afford. 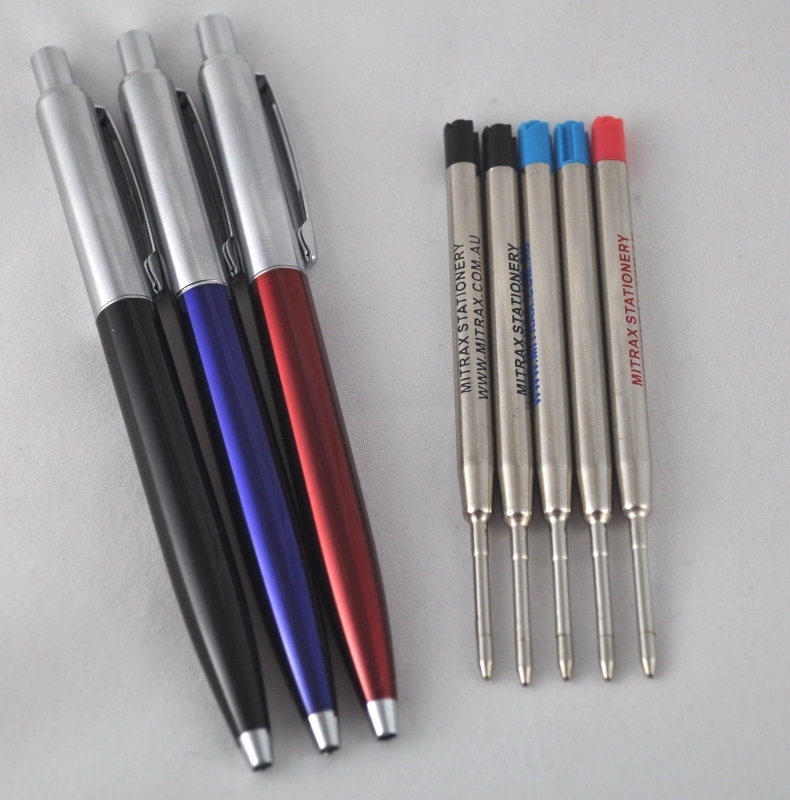 Ball point pens operate on a very simple principle whereby an ink reservoir is connected to a writing tip which contains a small metal ball, housed in a ball socket allowing it to rotate freely. 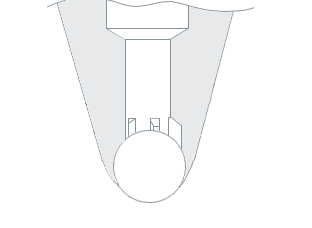 The ink reservoir is filled with a viscous, quick drying ink which is brought into contact with the ball via ink channels, and transferred onto paper in a smooth and uniform style as the ball rotates across it's surface. Figure 1: Ballpoint pen tip. Ballpoint ink consists of a dye dissolved into a solvent, usually oil, which is specially formulated to be thick and fast-drying. The viscosity of ballpoint ink is precisely controlled to ensure it is as thick as possible whilst still being able to flow down the barrel of the pen to the tip where it is in constant contact with the ball point. The use of an oil based solvent with soluble dye ensures that writing from a ball point pen is permanent and water-fast once dry. Ball point pen tip sizes are divided into 3 widths fine, medium, and broad based on the thickness of the line the tip leaves when it is rolled across paper. Although these definitions may vary between manufactures fine tips are generally defined as being 0.8 mm or less, medium 1.0 - 1.2 mm, and broad greater than 1.4 mm. Ball point tips with a width of 0.7mm are by far the most commonly used. Rollerball pens work on the same principle as ball point pens but use a thin water based inks inplace of the thicker oil based inks used by a ball point pen. The less viscous ink used in a roller ball means that they write more evenly with less effort than a ball point. The trade off for smoother writing is that the ink is consumed more quickly resulting in less writing distance from a Rollerball refill and the water based ink is easily removed and not suitable for use on official documents due to its lack of permanency. If you are looking for a pen that moves freely, produces great looking writing, and does not require a guarantee of permanency then you should consider a roller ball. Rollerball pens are ideal for letters, memos, exam papers and other similar tasks where speed, legibility, and ease of writing are the primary concerns. Like ballpoint pens, roller ball tip sizes are divided into 3 width based categories based on the thickness of the line the tip leaves when it is rolled across paper. Micro tips leave a line which is less than or equal to 0.5mm, fine tips result in a line width of around 0.7mm, and bold tips leave a thicker line which is typically more than 0.8mm wide. Gel pens also work on the same principle as ball point pens but use a thick Gel base ink containing a suspension of pigments inplace of oil based inks used by a ball point pen. The use of suspended pigments in roller ball inks means that they can create permanent, bold lines in a large range of colours, and can provide metallic or glittery effects. Gel Pens provide the permanency of ball point pens with the smooth writing of Roller ball pens. The only trade off being that the gel ink is consumed more quickly than a ballpoint pen resulting in a similar writing distance to a Rollerball pen. If you are looking for a pen that moves freely, produces great looking writing in a variety of colours , and requires a guarantee of permanency then you should consider a gel pen. Gel pens are ideal for letters, cheques, legal documents, artwork, autographs where aethsetics and permanency are of primary concern. Like ballpoint pens and roller ball pens, Gel pen tip sizes are divided into 3 width based categories based on the thickness of the line the tip leaves when it is rolled across paper. Micro tips leave a line which is less than or equal to 0.5mm, fine tips result in a line width of around 0.7mm, and bold tips leave a thicker line which is typically more than 0.8mm wide.